JISHOU, HUNAN — The Bitcoin winter in China may be thawing finally. I can use my bank card at the Huobi.com Bitcoin exchange once again. As I related earlier, the new national regulations concerning Bitcoin exchanges seemed to have shut me, and other foreigners, out of the exchanges indefinitely. BTCChina told me flat out that foreigners would not be allowed to trade with them anymore. Huobi did allow me to re-register with my name exactly as it is listed on my passport, but I could not bind my Chinese debit card to the account because I had no Chinese ID number. That ended Monday, when I got a call from Huobi saying I could again use my Chinese Unionpay card. Huobi’s system now accepts my US passport number as a proper form of ID to be linked with the card. I also had to do a “video verification” by participating in a video call on the QQ messaging client with a Huobi agent. She asked me a few questions, like my name, the source of the funds I would be using, and my reasons for trading in Bitcoin. I also had to show her my passport and my debit card. 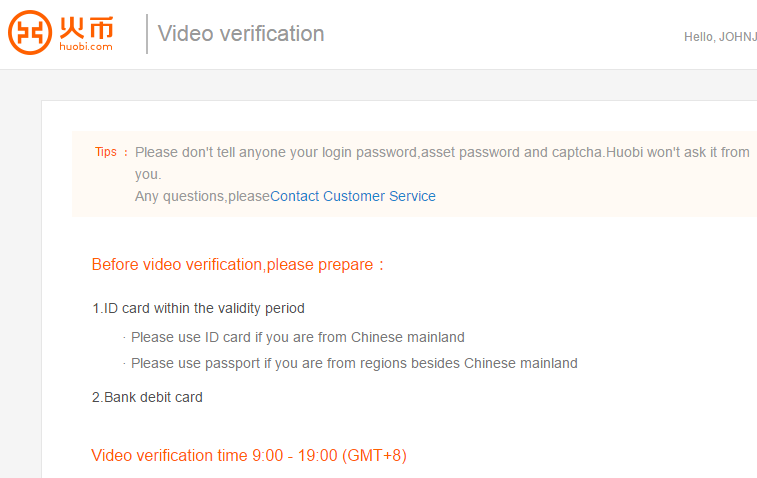 News reports had stated that video verifications would be required for all Huobi clients, but their website says only users over the age of 60 (like me) had to get on camera. At first I thought it was age discrimination, but today I realized it was probably intended to prevent unscrupulous traders from illicitly using their parents’ IDs and bank cards, as well as making sure the older clients were in full possession of their wits. I passed, by the way. Withdrawals of Bitcoin and Litecoin are still suspended indefinitely, so I still can’t use either to send funds abroad — or anywhere else, really. But I can now trade on Huobi to try to make more yuan, which is at least a step in the right direction. Celebrate my good fortune with me and leave me a tip using this Bitcoin address. Originally published at Wheat-dogg’s World.